The knowledge of soil temperature at different depths is important for agricultural industry and for understanding climate change. The aim of this study is to evaluate the performance of a support vector regression (SVR)-based model in estimating daily soil temperature at 10, 30 and 100 cm depth at different climate conditions over Iran. The obtained results were compared to those obtained from a more classical multiple linear regression (MLR) model. The correlation sensitivity for the input combinations and periodicity effect were also investigated. 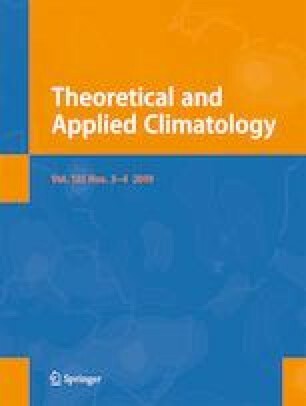 Climatic data used as inputs to the models were minimum and maximum air temperature, solar radiation, relative humidity, dew point, and the atmospheric pressure (reduced to see level), collected from five synoptic stations Kerman, Ahvaz, Tabriz, Saghez, and Rasht located respectively in the hyper-arid, arid, semi-arid, Mediterranean, and hyper-humid climate conditions. According to the results, the performance of both MLR and SVR models was quite well at surface layer, i.e., 10-cm depth. However, SVR performed better than MLR in estimating soil temperature at deeper layers especially 100 cm depth. Moreover, both models performed better in humid climate condition than arid and hyper-arid areas. Further, adding a periodicity component into the modeling process considerably improved the models’ performance especially in the case of SVR.